The Aston Villa boss says he would like to put the issue to bed. Lambert and Keane have parted ways. 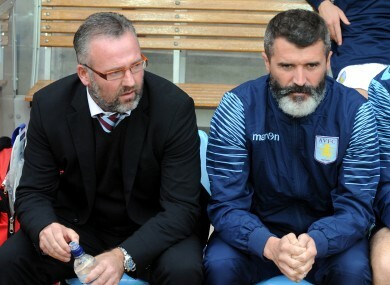 ASTON VILLA MANAGER Paul Lambert insists that Roy Keane’s departure was not the result of a dressing room bust-up. Keane left the Premier League club last week in order to concentrate on his duties as Ireland assistant but reports in the media on Monday suggested that his sudden exit was down to a falling out. However, Lambert spoke out after last night’s 1-0 win over Crystal Palace and says he would like to put the story to bed. “If anyone wants to know about Roy, I’ll put it on your plate so you know: there’s absolutely no problem whatsoever,” Lambert said. “He’s got a lot of commitments with Ireland, he’s never had a break from going away with Ireland, and never had a break from Aston Villa. So I totally respect his decision. Contrary to reports, there was absolutely nothing, absolutely no bust-up, no arguing, nothing like that. I thank him for his time coming to work for me. Email “'There was absolutely no bust-up' - Lambert speaks out about Keane departure”. Feedback on “'There was absolutely no bust-up' - Lambert speaks out about Keane departure”.